It looked like a grand party in The Roxy, a quaint dance studio in Tomas Morato, Quezon City. 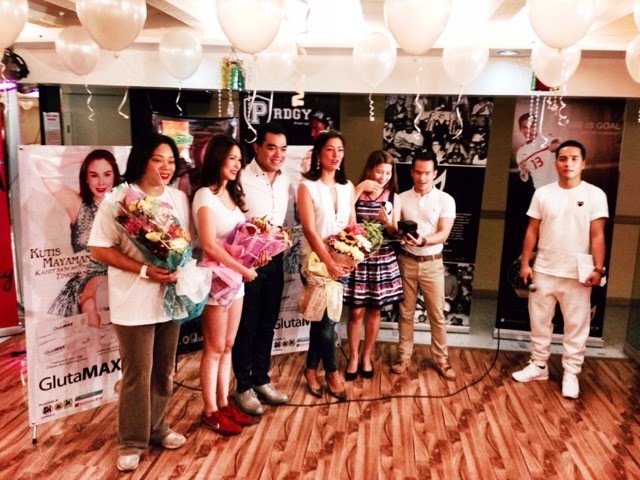 The Philippines number one premium whitening brand Glutamax and Posh Nails has held a White Zumba Party to celebrate their brand's partnership. From now on, Glutamax products will be seen quite frequently in Posh Nails branches and they on the other hand will be dishing out Whitening Manicure+Pedicure Services that's Powered by Glutamax. Isn't that awesome? They promise to make your nails stain free, lighter, smoother and more youthful. Jusy ask their pretty endorsers Stephanie Sol from GMA and Alice Dixon of whom we saw that afternoon. Glutamax still carries the best underarm and inner thigh cream, light and firm facial wash, instant white lotion (oh yes they have that! ), light and tight feminine wash (for the ladies), reduced glutathione capsule, lightening soap, lightening lotion, deodorant and antiperspirant lightening cream and you can buy them all in leading supermarkets nationwide. In the event, they also awarded the best outfit and best zumba participant. No less than the gorgeous Alice Dixon awarded the participants. They really enjoyed the activity that afternoon. Healthwell Nutraceuticals Inc. is an affiliate of YSA skin care corporation. It is founded by its Chairman Robert Nazal and their President Jose Paulo Legaspi.